You can reveal this card in your hand; your opponent randomly chooses 1 card from your entire hand, then you discard the chosen card. Then, if the discarded card was not “Danger! Chupacabra!”, Special Summon 1 “Danger! Chupacabra!” from your hand, and if you do, draw 1 card. 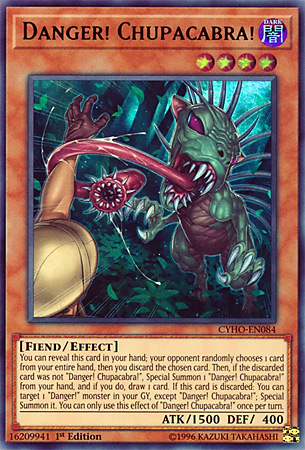 If this card is discarded: You can target 1 “Danger!” monster in your GY, except “Danger! Chupacabra!”; Special Summon it. You can only use this effect of “Danger! Chupacabra!” once per turn. We finish up with the “Danger!” archetype with Danger! Chupacabra! A weaker “Danger!” monster like Jacaklope, when it isn’t discarded by your opponent you get the free Special Summon and a draw like Nessie. If it gets picked, you get a revival from your grave of any “Danger!” monster except itself. Depending on your situation and the style you play, either can work out. In a Dark World variant, you may have Rank 4 plays with this and other monsters. However, there may be a time when you need that Nessie or Bigfoot that’s in the grave and you need your opponent to call it right in your hand for a change. As a Fiend-Type, Chupacabra works well in the Dark World variant alongside Gates and the above-mentioned Rank 4 summoning with Snoww. It is the only monster of the “Danger!” archetype that has base ATK. Either you have too low or too high. As their only Level 4, this is traditional of Level 4 searchers. The final Danger! card to look at is here for today’s review, Danger! Chupacabra! Chupacabra! is a Level 4 DARK Fiend with 1500 ATK and 400 DEF. I’ve seen better and worse stats on a Level 4. DARK is a great attribute and Fiend is a good type. Chupacabra! has the standard Danger! effect for summoning, of course. When Chupacabra! is discarded, you can revive a Danger! from the GY except another Chupacabra! and this is a hard once per turn. Well early on this effect seems to be dead in the water if discarded, since you are less likely to have a Danger! in the GY, but an archetype being able to revive their monsters is always nice. Getting back a Bigfoot! for a good attacker or a Nessie! for a good defender is always great. Chupacabra! might be the worst of the bunch, but he still has his uses. Plus being a Fiend lets you banish it for Gates of the Dark World if you are playing Danger! Dark World. Art: 4.25/5 Might be the scariest of the Danger! monsters in terms of art. That thing is terrifying. A Chupacabra, rare/mythical as they may be, could be danger! (ous) for sure. Still Dark, Fiend this time, Level 4, 1500 attack (which is meh, but as I said more than once, the Monster pool in this family needs to be expanded certainly) and a very minimal 400 defense. I guess you aren’t allowed to have (at this point) a good attack and defense you get one good or decent one, and your other stat is jank. We’re going to skip the Summon/Discard, because I assume y’all are intelligent and have read that sometime here in the last week. The Draw effect is still here too, of course, which we like, and only fuels the speed of this Deck. If Chupacabra! is discarded, you get to Target and Special Summon a Danger! Monster from your Graveyard, save this card itself. Not much else to say. In the small pool, this is the best Level 4 attacker they have (Jackalope?) has only 500 attack, and this card cycles from the Graveyard instead of the Deck, so while this effect is meh now with a small card pool, it should get better when it grows. Jackalope? is better with the from the Deck effect, at least in the now, in my opinion. Art: 5/5 This thing is disturbing. I’m not sure scary is proper, but weird and one of those ‘you can’t unsee’ pictures.